Summary: 55-year-old Zachary Kermit was once a superstar teacher on the rise, but after being falsely accused of taking part in a cheating scandal, he became disillusioned. Now he’s just putting in his time until he can retire and collect his pension. His final year, he’s assigned to room 117, the class of “unteachable” eighth graders who are basically being warehoused until the school can pass them on to the high school. At first, Mr. Kermit just passes out worksheets, then spends the rest of his day with a crossword puzzle and oversized cup of coffee, while the students entertain themselves however they want. But slowly, against his will, he starts to connect with the students, and vice versa. 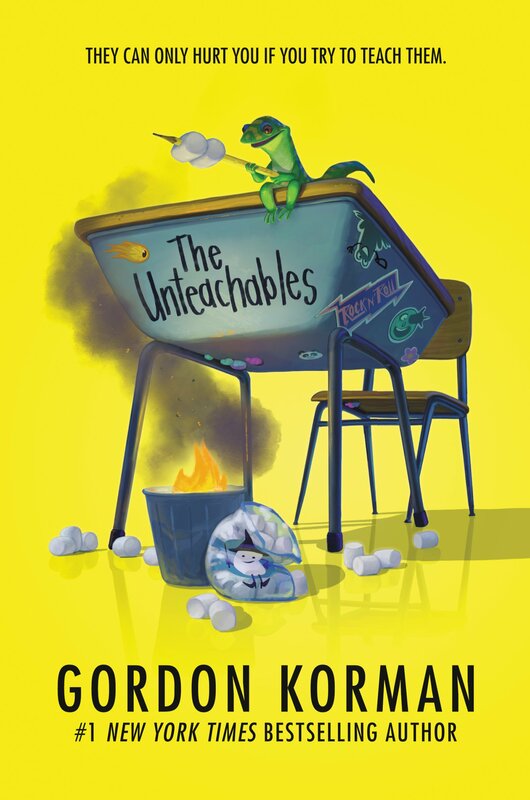 When the kids learn that the superintendent plans to fire him, trying to save the district from having to pay his pension, they find hidden resources within themselves to try to save his job. Will Mr. Kermit get another shot at teaching, or is it too late for him? 288 pages; grades 4-7. Pros: A classic Gordon Korman story, with a fast-paced plot, plenty of humor, and a story told from multiple points of view. Fans will not be disappointed. Cons: While I enjoyed the story, I didn’t feel it was quite up to the standards of some of my Korman favorites like Restart and Schooled.